← Which Veterinarian Would You Choose For Your Cat? This is a short post looking at a way for vets to offset loses due to ceasing to do declawing operations. Yes, guys, you’ll have to stop one day, so why not start right away thinking about alternative business opportunities that actually benefits the animal. We are aware that a sizable percentage of cat and dog owners are unable to control their companion animal’s diet adequately to the point where he or she becomes obese. In Britain it is estimated that by 2026 more than half of all dogs will be overweight. Currently in the UK about 3 million cats are overweight. In America the figure is higher. I am thinking of ways an American vet can offset the loss of financial profits from declawing (very common) and devocalization (relatively rare) operations. 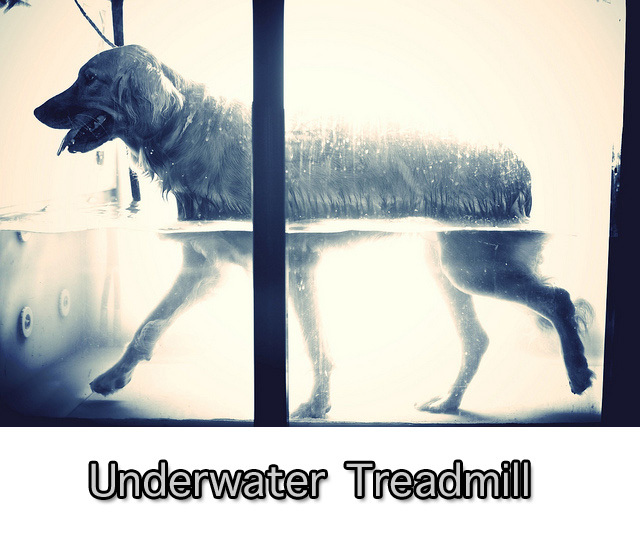 Underwater Treadmill with Dog. Photo by frank3.0. Vets are loathe to give up the money spinner that declawing has become. But surely there are other ways to make money in responding to new health problems? The overarching health problem for pets in 2013 is obesity or perhaps to be more fair: becoming overweight. Obesity brings with it health problems. If vets can take preventative steps by helping people’s pets to lose weight wouldn’t this be popular? It would reduce vet’s bills! That by the way may be why vets don’t want people to take preventative steps that would improve their pet’s health. Perhaps I am being too cynical. My suggestion mainly concerns dogs but the principle is the same: look for alternative business that addresses real and current health issues. In the UK the Pet Fitness Club run by the PDSA (a veterinary charity) is seeing increased activity in respect of pet fitness programs devised for overweight pets. At Donaldson’s vets in Huddersfield, West Yorkshire (the north of England), they have an underwater treadmill that tackles the task of achieving weight loss in pets. On the basis that people have difficulties in managing their pet’s weight, and on the basis that a good number of better off people can afford it, a scheduled visit to the vet for a treadmill session would seem a good idea. It would be a bit like a pet gym session. The routine of going to a gym is a good way of creating some self discipline. So, how many vets in the USA have an underwater treadmill designed to attack obese dogs and even cats? I suppose cats can use it too but are less suited. Why don’t more vets set up pet weight loss classes and seminars combined with a session on an underwater treadmill? If a dog is very obese it is unsuitable to take him for a run. A programmed weight loss regime using a device like a treadmill that exercises muscles in a controlled way would seem to be suitable and a good little earner as well. Then the vet can stop declawing and show his clients what a good vet he really is by being genuinely concerned with the health and welfare of his patients rather than giving the impression that he is out to squeeze the maximum out of the client while being less than concerned for the animal’s welfare. This entry was posted in Cat Anatomy, Cat Health, Declawing, Human to cat relationship, Veterinarians, Weight and tagged cat health, veterinarians by Michael Broad. Bookmark the permalink. Great idea. I’m sure vets could think of plenty more things that would be beneficial to health and cost effective. Is it too cycnical to think they don’t want your animal to be healthy? This is frightening. I suppose in an area where there is not enough business then it is logical to consider the idea. I sometimes believe that some vets want pets to be unhealthy. Sounds horrible but it brings in business. Do vets ever do preventative medicine other than vaccinations? I’m glad you came up with an alternative to profiteering off of mutilation aka declawing. The underwater treadmill is a great idea and I hope a lot of vets take you up on it. Cats could use a regular treadmill; one without water. If the treadmills concept worked out well, vets might consider a monthly membership like they have at gyms. Thanks Liz. I would do anything to see vets stop declawing. There must be alternative forms of revenue. There is no need for vets to be so cruel and heartless just for a bit of extra money. I want to see vets show some imagination and concern.